A.W. 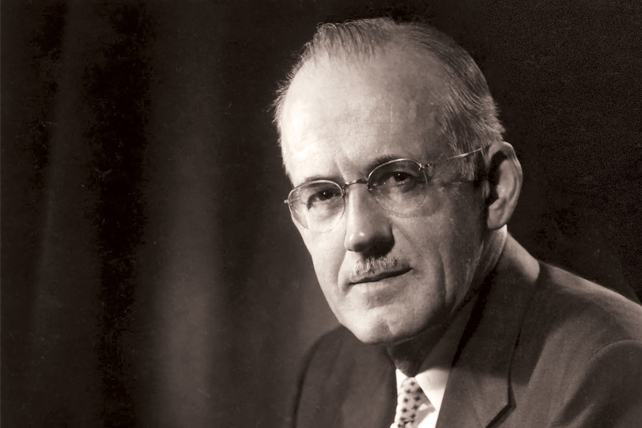 Tozer has had a great impact on my life. His book The Knowledge of the Holy, which profoundly influenced me when I came to Christ as a teenager, is a classic that I think people today need to read. In the book, Tozer spoke of the attributes of God. He wrote, “What comes into our minds when we think about God is the most important thing about us.” Unfortunately, many modern Christians have reduced Him to a single-attribute God. Never mind that the angels in God’s presence do not cry out, day and night, “Love, love, love,” but “Holy, holy, holy is the Lord Almighty” (Isaiah 6:3, NIV). Certainly love is a very important attribute of God. God is love, we’re told in 1 John 4:16, so in some senses it is a defining quality of God. However, this does not minimize His other qualities, and that’s the problem: When you start saying (as I’ve heard people say) we must interpret all of God’s attributes in light of His love, you introduce the error of us imposing our limited understanding of love onto God, and recreate Him into our image. By all means, we should rejoice in God’s mercy and love. But we must also recognize that our Lord is relentlessly holy, righteous and just. “Your eyes are too pure to look on evil; you cannot tolerate wrong” (Habakkuk 1:13, NIV). The universe exists not for Love’s glory, but for God’s glory. The apostle John, by the Spirit, wrote, “God is love,” and some have taken his words to be a definitive statement concerning the essential nature of God. This is a great error. John was by those words stating a fact, but he was not offering a definition. Equating love with God is a major mistake which has produced much unsound religious philosophy and has brought forth a spate of vaporous poetry completely out of accord with the Holy Scriptures and altogether of another climate from that of historic Christianity. Had the apostle declared that love is what God is, we would be forced to infer that God is what love is. If literally God is love, then literally love is God, and we are in all duty bound to worship love as the only God there is. If love is equal to God then God is only equal to love, and God and love are identical. Thus we destroy the concept of personality in God and deny outright all His attributes save one, and that one we substitute for God. The God we have left is not the God of Israel; He is not the God and Father of our Lord Jesus Christ; He is not the God of the prophets and the apostles; He is not the God of the saints and reformers and martyrs, nor yet the God of the theologians and hymnists of the church. For our souls’ sake we must learn to understand the Scriptures. We must escape the slavery of words and give loyal adherence to meanings instead. Words should express ideas, not originate them. We say that God is love; we say that God is light; we say that Christ is truth; and we mean the words to be understood in much the same way that words are understood when we say of a man, “He is kindness itself.” By so saying we are not stating that kindness and the man are identical, and no one understands our words in that sense. The words “God is love” mean that love is an essential attribute of God. Love is something true of God but it is not God. It expresses the way God is in His unitary being, as do the words holiness, justice, faithfulness and truth. Because God is immutable He always acts like Himself, and because He is a unity He never suspends one of His attributes in order to exercise another. From God’s other known attributes we may learn much about His love. We can know, for instance, that because God is self-existent, His love had no beginning; because He is eternal, His love can have no end; because He is infinite, it has no limit; because He is holy, it is the quintessence of all spotless purity; because He is immense, His love is an incomprehensibly vast, bottomless, shoreless sea before which we kneel in joyful silence and from which the loftiest eloquence retreats confused and abashed. Yet if we would know God and for other’s sake tell what we know, we must try to speak of His love. All Christians have tried, but none has ever done it very well. I can no more do justice to that awesome and wonder-filled theme than a child can grasp a star. Still, by reaching toward the star the child may call attention to it and even indicate the direction one must look to see it. So, as I stretch my heart toward the high, shining love of God, someone who has not before known about it may be encouraged to look up and have hope. …To know that love is of God and to enter into the secret place leaning upon the arm of the Beloved—this and only this can cast out fear. Let a man become convinced that nothing can harm him and instantly for him all fear goes out of the universe. The nervous reflex, the natural revulsion to physical pain may be felt sometimes, but the deep torment of fear is gone forever. God is love and God is sovereign. His love disposes Him to desire our everlasting welfare and His sovereignty enables Him to secure it. Next articleDoes God Trust YOU?